The Phoenix 300 LGR Dehumidifier, designed for the larger water damage restoration project, is a very high capacity unit capable of extracting over 300 pints per day at saturation. Its LGR technology makes it an efficient unit to operate and effective at lowering specific humidity. The heavyweight of the Phoenix range the 300 is nevertheless easily portable and relatively compact for its power. Thoughtfully designed, with the needs of the water damage restoration specialist in clear focus, this unit has all the features and performance required for demanding restoration jobs. The Phoenix 300 LGR Dehumidifier will remove 176 pints of moisture from the air every 24 hours at 80°F and 60% relative humidity. These conditions are prescribed by AHAM (Association of Home Appliance Manufacturers) as a standard for comparing dehumidifiers. In more extreme conditions, such as may be encountered in some restoration jobs, the 300 will extract even more, rising to 232 pints at 80°F/80%RH and 304 pints at 90°F/90%RH. This massive water extraction power is achieved using a single 15amp/110v circuit and reflects Phoenix's design aim to achieve maximum water extraction from a standard circuit. This allows the unit to be utilized at almost any location and to deal with the drying of large areas. 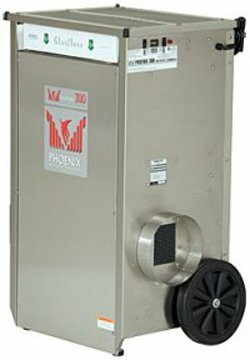 The Phoenix 300 is a Low Grain Refrigerant (LGR) dehumidifier. This technology enables the unit to remove more water from a given volume of air than a conventional refrigerant dehumidifier. This is achieved by pre-cooling the air before it passes over the condensation coils and both accelerates the drying process and enables the unit to reduce specific humidity to a lower level than a conventional dehumidifier. This is particularly important where deep drying is a requirement. LGR dehumidifiers achieve these improvements in water extraction without using more power which makes the 300 an energy efficient unit (drawing just 12 amps) as well as a more effective one. The Phoenix 300 LGR dehumidifier has a large temperature operating range from 33°F to 110°F. An effective auto-defrost system enables low temperature operation down to the practical limit for any refrigerant dehumidifier while its upper limit of 110°F exceeds that of many other water damage restoration dehumidifiers by anything from 5 to 15 degrees. Like all Phoenix LGR dehumidifiers the 300 provides multiple ducting options which allow both the intake air and the filtered and dehumidified air to be ducted as required. This enables the unit to be combined easily with equipment such as HEPA air scrubbers, room air conditioners or desiccant dehumidifiers if required. The impressive air processing capacity of 540 CFM not only enables faster drying but also provides higher static pressure to facilitate ducted operation. Intake air is cleaned of most air-borne particles by a pleated media 57% MERV-8 filter to protect the unit and improve air quality. This can be upgraded with an optional 95% MERV-14 filter if required. Disposal of the condensate is made easier by an internal condensate pump which is powerful enough to provide up to 20 feet of vertical lift if needed. A 30 foot drain hose is supplied with the unit. The condensate is collected in an internal reservoir which is automatically purged at regular intervals. The pump can be manually purged, using a switch on the control panel, to eliminate risk of water spillage while in transit. Despite its power the Phoenix 300 LGR dehumidifier is designed to be portable between locations and easy to manoeuvre on site. With exterior dimensions of only 29 x 25 x 46 the unit is compact for its power and the provision of sturdy wheels on a rear mounted axle and a convenient handle for control allow easy movement around the working area. At 175lb the unit is heavy in absolute terms but commendably light for its capacity and a manageable weight for transport in smaller vehicles. The unit is robust enough to withstand the rigors of work in tough conditions and the frequent movements between sites. The wheels are mounted on a shock absorbing axle to cushion the unit and the whole is encased in a stainless steel cabinet to resist corrosion and protect the dehumidifier from accidental impacts. The Phoenix 300 LGR is backed by a five year warranty covering all refrigeration parts, the first year of which covers all parts and labor.